With the U.S. terrorist threat level at orange airport security lines can be time consuming. If you are a frequent traveler like I am you probably are not a big fan of waiting in lines while unexperienced travelers struggle to learn the ropes. Clear, a New York-based identity verification startup founded in 2003, looks to speed up airport security checkpoints by pre-screening travelers. For $99 per year travelers can sign up for the Clear service and receive a pre-screened identification card for getting through airport security more quickly. Clear card users will be able to access designated airport security express lines at participating airports. I recently flew back from San Francisco airport and ran into a Clear cube which can verify your iris or fingerprint as a second step in the Clear card setup process which starts with an online application at: flyclear.com. It appears Clear is similar to the highway open tolling concept which has made driving on the tollway a lot smoother driving. 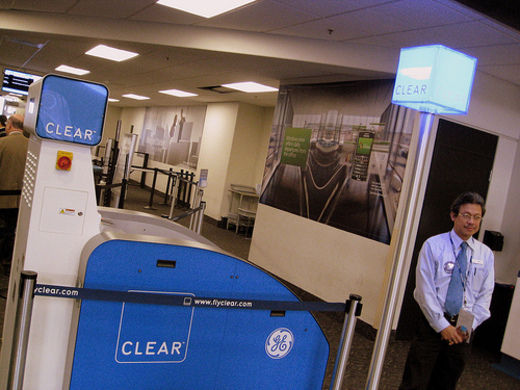 It will be interesting to see if Clear's benefits are much different than what my frequent traveler status express airport security lines already offer - I am a little skeptical.